Drumvolution – Drum programming evolved. 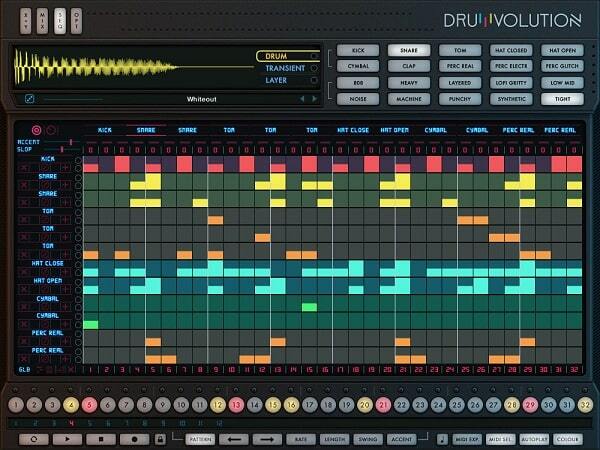 Drumvolution is a forward-thinking, truly modern Drum Engine powered by a ground-breaking library of 28,000+ electronic drums and sound design tools. Featuring a slick design and unprecedented creative workflow, Drumvolution delivers an intuitive Drum Layering Engine and Browser, X+Y Pad, extensive modular Macro System, Parameter-lock Effects, Polyrhythmic Sequencing, extensive sound design parameters, and over 400 beautifully designed presets. Drumvolution’s sound engine combines beautifully designed analogue / electronic drums and acoustic instruments in a ground-breaking new way. A labour of love with an astonishing level of detail, Drumvolution’s sound library is our biggest achievement to date, spanning 5 years and thousands of hours of sound design. All captured by mastering-grade conversion via impressive analogue signal chains.